Step 1: See your pet’s veterinarian. Don’t assume that because you can’t see any fleas, your dog or cat doesn’t have a flea allergy. Often, animals with one groom themselves constantly. They may remove any fleas from their bodies — but the allergic reaction from bites can last for weeks. Step 2: Break the cycle. Putting an end to your pet’s flea allergy means getting rid of fleas. Though they’re more common in warmer months, fleas can live year-round indoors. Once they lay eggs, new fleas hatch and then lay more eggs, which means your pet is constantly exposed. Step 3: Ease the itch. Your pet’s veterinarian will recommend a topical, oral, or injected medication to ease your pet’s itching and inflammation. If your dog or cat has an infection, the veterinarian may also prescribe an antibiotic or antifungal medicine. “Unless your pet hates water, this can help by making their skin feel better and removing some fleas,” Zabell says. 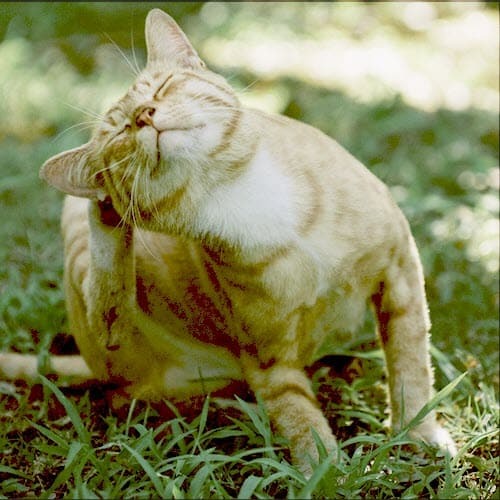 Don’t use flea shampoo or other topical flea products without talking to your pet’s veterinarian first. Step 5: Stay in touch with your pet’s veterinarian. “Regular checkups are especially important for spotting infection and making sure your flea and allergy treatment plans are working,” Zabell says. At FCVC we are concerned for your pets’ health and well-being. We want to partner with you to help make you super-hero pet parents to your feline and canine friends. Give us a call if you think your pets may be affected by fleas or any other allergy. Call 970-587-5140. If you enjoyed this article, you may find these articles of interest – Fleas – Small Pests, Big Problem and Fleas on a Indoor Cat? and Cats with Allergies. From our friends at WebMd.com.